Lee Kuan Yew at the Pentagon in 2002. This is a Chinese name; the family name is Lee. Lee Kuan Yew, GCMG, CH (Honorary) (Chinese: 李光耀; pinyin: Lǐ Guāngyào; 16 September 1923 – 23 March 2015; also Lee Kwan-Yew) was a Singaporean politician. He was the first Prime Minister of the Republic of Singapore from 1959 to 1990. He was the co-founder and first secretary-general of the People's Action Party (PAP), and led the party to a landslide victory in 1959. During his leadership, Singapore separated from the Federation of Malaysia in 1965 and grew from an underdeveloped colonial outpost with no natural resources into a "First World", Asian Tiger. He has remained one of the most influential political figures in South-East Asia. Under Singapore's second prime minister Goh Chok Tong, Lee served as Senior Minister. He served as Minister Mentor, a post created when his son Lee Hsien Loong became the nation's third prime minister on 12 August 2004, until 2011. On 13 September 2008, Lee, 84, underwent successful treatment for abnormal heart rhythm (atrial flutter) at Singapore General Hospital, but he was still able to address a philanthropy forum via video link from hospital. Lee died on 23 March 2015 from pneumonia, aged 91. Lee says in his autobiography that he is a fourth-generation Chinese Singaporean: his Hakka great-grandfather, Lee Bok Boon (born 1846), emigrated from the Dapu county of Guangdong province to the Straits Settlements in 1862. Lee Kuan Yew was born at 92 Kampong Java Road in Singapore. He was the oldest child of Lee Chin Koon and Chua Jim Neo. As a child he was strongly influenced by British culture, partly because of the influence of his grandfather Lee Hoon Leong, who had given his sons an English education. Lee and his wife Kwa Geok Choo were married on 30 September 1950. They have two sons (Lee Hsien Loong and Lee Hsien Yang) and one daughter (Lee Wei Ling). His elder son Lee Hsien Loong has been Prime Minister of Singapore since 2004. Many of Lee's family have important positions in Singaporean society, and his children hold high government or government-linked posts. His elder son Lee Hsien Loong, a former Brigadier General, has been the Prime Minister since 2004. He is also the Deputy Chairman of the Government of Singapore Investment Corporation (GIC), of which Lee himself is the chairman. Lee's younger son, Lee Hsien Yang, is also a former Brigadier General and is a former President and Chief Executive Officer of SingTel, a pan-Asian telecommunications giant and Singapore's largest company by market capitalisation (listed on the Singapore Exchange, SGX). Fifty-six percent of SingTel is owned by Temasek Holdings, a prominent government holding company with controlling stakes in a variety of very large government-linked companies such as Singapore Airlines and DBS Bank. Temasek Holdings was until 2009 run by Executive Director and C.E.O. Ho Ching, the wife of Lee Hsien Loong. Lee's daughter, Lee Wei Ling, runs the National Neuroscience Institute. Lee's wife, Kwa Geok Choo, used to be a partner of the prominent legal firm Lee & Lee. Lee studied at Telok Kurau Primary School, Raffles Institution (where he was a member of the 01 Raffles Scout Group), and Raffles College (now National University of Singapore). He was stopped from going to university by World War II and the 1942-1945 Japanese occupation of Singapore. During the occupation, he ran a successful black market business selling tapioca-based glue called Stikfas. Because he had taken Chinese and Japanese lessons since 1942, he was able to find work transcribing Allied wire reports for the Japanese, as well as being the English language editor on the Japanese Hodobu (報道部 – an information or propaganda department) from 1943 to 1944. Lee had three main concerns — national security, the economy, and social issues — during his post-independence administration. The vulnerability of Singapore was deeply felt, with threats from multiple sources including the communists, Indonesia (with its Confrontation stance), and UMNO extremists who wanted to force Singapore back into Malaysia. As Singapore gained admission to the United Nations, Lee quickly sought international recognition of Singapore's independence. He declared a policy of neutrality and non-alignment, following Switzerland's model. At the same time, he asked Goh Keng Swee to build up the Singapore Armed Forces (SAF) and requested help from other countries for advice, training and facilities. Like many countries, Singapore was not immune to political corruption. Lee introduced legislation giving the Corrupt Practices Investigation Bureau (CPIB) greater power to conduct arrests, search, call up witnesses, and investigate bank accounts and income-tax returns of suspected persons and their families. Lee believed that ministers should be well paid in order to maintain a clean and honest government. In 1994 he proposed to link the salaries of ministers, judges, and top civil servants to the salaries of top professionals in the private sector, arguing that this would help recruit and retain talent to serve in the public sector. In the late 1960s, fearing that Singapore's growing population might overburden the developing economy, Lee started a vigorous 'Stop-at-Two' family planning campaign. Couples were urged to undergo sterilisation after their second child. Third or fourth children were given lower priorities in education and such families received fewer economic rebates. In 1983, Lee sparked the 'Great Marriage Debate' when he encouraged Singapore men to choose highly-educated women as wives. He was concerned that a large number of graduate women were unmarried. Some sections of the population, including graduate women, were upset by his views. Nevertheless, a match-making agency Social Development Unit (SDU) was set up to promote socialising among men and women graduates. Lee also introduced incentives such as tax rebates, schooling, and housing priorities for graduate mothers who had three or four children, in a reversal of the over-successful 'Stop-at-Two' family planning campaign in the 1960s and 1970s. By the late 1990s, the birth rate had fallen so low that Lee's successor Goh Chok Tong extended these incentives to all married women, and gave even more incentives, such as the 'baby bonus' scheme. He was retired from politics in 2011. Goh Chok Tong was also retired as well, but he is staying in Marine Parade GRC. On 5 February 2015, Lee was hospitalised with "severe pneumonia" and was put on a ventilator at the intensive care unit of Singapore General Hospital, although his condition was reported as "stable". A 26 February update stated that Lee was again being given antibiotics, while being sedated and still under mechanical ventilation. On 23 March 2015, Singaporean Prime Minister Lee Hsien Loong announced the death of Lee Kuan Yew, at the age of 91. His state funeral was held at the University Cultural Centre, National University of Singapore at 2 p.m. local time on 29 March 2015. During the three decades in which Lee held office, Singapore grew from being a developing country to one of the most developed nations in Asia, despite its small population, limited land space and lack of natural resources. Lee has often stated that Singapore's only natural resources are its people and their strong work ethic. He is widely respected by many Singaporeans, particularly the older generation, who remember his inspiring leadership during independence and the separation from Malaysia. On the other hand, many Singaporeans have criticized Lee as being authoritarian and intolerant of dissent, citing his numerous mostly successful attempts to sue political opponents and newspapers who express an unfavorable opinion. International media watchdog Reporters Without Borders has asked Lee, and other senior Singaporean officials, to stop taking libel actions against journalists. Lee has written a two-volume set of memoirs: The Singapore Story (ISBN 0-13-020803-5), which covers his view of Singapore's history until its separation from Malaysia in 1965, and From Third World to First: The Singapore Story (ISBN 0060197765), which gives his account of Singapore's subsequent transformation into a developed nation. Lee has received a number of state decorations, including the Order of the Companions of Honour (1970), Knight Grand Cross of the Order of St Michael and St George (1972), the Freedom of the City of London (1982), the Order of the Crown of Johore First Class (1984), the Order of Great Leader (1988) and the Order of the Rising Sun (1967). Lee was awarded the Ig Nobel Prize in 1994. In 2002, Lee was formally admitted to the Fellowship of Imperial College London in recognition of his promotion of international trade and industry, and development of science and engineering study initiatives with the UK. In 2006, Lee was presented with the Woodrow Wilson Award for Public Service by the Woodrow Wilson International Center for Scholars. In 2007, Lee was conferred an honorary Doctorate in Law at the Australian National University in Canberra, albeit amid protest from students and staff. "He has become a seminal figure for all of us. I've not learned as much from anybody as I have from Mr Lee Kuan Yew. He made himself an indispensable friend of the United States, not primarily by the power he represented but by the quality of his thinking. "... one of the legendary figures of Asia in the 20th and 21st centuries. He is somebody who helped to trigger the Asian economic miracle." On 15 November 2009, Lee was awarded the Russian Order of Friendship by President Dmitry Medvedev on the sidelines of APEC Singapore 2009. Devan Nair, the third President of Singapore and who was living in exile in Canada, remarked in a 1999 interview with the Toronto The Globe and Mail that Lee's technique of suing his opponents into bankruptcy or oblivion was an abrogation of political rights. He also remarked that Lee is "an increasingly self-righteous know-all", surrounded by "department store dummies". In response to these remarks, Lee sued Devan Nair in a Canadian court and Nair countersued. Lee then brought a motion to have Nair's counterclaim thrown out of court. Lee argued that Nair's counterclaim disclosed no reasonable cause of action and constituted an inflammatory attack on the integrity of the government of Singapore. However, the Ontario Superior Court of Justice refused to throw out Nair's counterclaim, holding that Lee had abused the litigating process and therefore Nair has a reasonable cause of action. In 2011, Wikileaks published diplomatic cables attributing controversial comments on Islam to Lee. Wikileaks quoted Lee as having described Islam as a "venomous religion". Lee later denied making the comments. "I have to speak candidly to be of value, but I do not wish to offend the Muslim community. I think we were progressing very nicely until the surge of Islam came, and if you asked me for my observations, the other communities have easier integration - friends, intermarriages and so on, Indians with Chinese, Chinese with Indians - than Muslims. That's the result of the surge from the Arab states. I would say today, we can integrate all religions and races except Islam. Be less strict on Islamic observances and say ‘Okay, I'll eat with you." According to former PM Goh Chok Tong, Singaporean Muslims adjusted their religious practices according to the unique circumstances in Singapore. The ethnic integration policy was also implemented to avoid the formation of ethnic ghettoes in Singapore's HDB flats. Every precinct had to have inhabitants from all the ethnic groups according to national proportions. On 24 September 2008 the High Court of Singapore, in a summary judgment by Justice Woo Bih Li, ruled that the Far Eastern Economic Review (FEER) magazine (Hugo Restall, editor), defamed Lee and his son, Prime Minister Lee Hsien Loong. The court found the 2006 article "Singapore's 'Martyr': Chee Soon Juan" meant that Lee Kuan Yew "has been running and continues to run Singapore in the same corrupt manner as T. T. Durai operated the National Kidney Foundation (NKF) and he has been using libel actions to suppress those who would question to avoid exposure of his corruption." The court sentenced FEER, owned by Dow Jones & Company (in turn owned by Rupert Murdoch's News Corp), to pay damages to the complainants. FEER appealed but lost the case when the Court of Appeal ruled in October, 2009 that the Far Eastern Economic Review did defame the country's founder Lee Kuan Yew and his son Prime Minister Lee Hsien Loong. Barr, Michael D. 2000. Lee Kuan Yew: The Beliefs Behind the Man. Washington D.C.: Georgetown University Press. Josey, Alex. 1980. Lee Kuan Yew — The Crucial Years. Singapore and Kuala Lumpur: Times Books International. King, Rodney. 2008. The Singapore Miracle, Myth and Reality. 2nd Edition, Insight Press. Kwang, Han Fook, Warren Fernandez and Sumiko Tan. 1998. Lee Kuan Yew: The Man and His Ideas. Singapore: Singapore Press Holdings. McCarthy, Terry (23 August 1999). "Lee Kuan Yew". Time Asia. Hong Kong. Minchin, James. 1986. No Man is an Island. A Study of Singapore’s Lee Kuan Yew. Sydney: Allen & Unwin. ↑ "Singapore told to feel free". The Guardian. London. Associated Press. 13 August 2004. ↑ "Singapore's Lee Kwan Yew hospitalized", International Herald Tribune, Paris, 13 September 2008. ↑ "The Cabinet - Mr LEE Kuan Yew". Retrieved 26 April 2008. ↑ Ooi, Jeff (2005). ""Perils of the sitting duck"". Archived from the original on 25 November 2005. Retrieved on 6 November 2005. ↑ McCarthy, Terry. Lee Kuan Yew, Time Asia, Hong Kong, 23 August 1999. ↑ Pillai, M.G.G. (1 November 2005). ""Did Lee Kuan Yew want Singapore ejected from Malaysia?"". Malaysia Today. Archived from the original on 13 October 2007. ↑ 9.0 9.1 9.2 9.3 Jacobson, Mark (January 2010). "The Singapore Solution". National Geographic Magazine. Retrieved 26 December 2009. ↑ Jaipragas, Bhavan (21 February 2015). "Singapore founding PM Lee Kuan Yew in ICU but 'stable'". ↑ "Lee Kuan Yew in hospital with severe pneumonia, condition 'stabilised'". Channel NewsAsia. 21 February 2015. ↑ "Doctors restart antibiotics for former PM Lee Kuan Yew". Yahoo Newsroom. Retrieved 26 February 2015. ↑ "Passing of Mr Lee Kuan Yew, founding Prime Minister of Singapore". Prime Minister's Office Singapore. Retrieved 22 March 2015. ↑ "BBC News - Singapore's Lee Kuan Yew dies". BBC News. London. BBC. 22 March 2015. ↑ "Prime Minister declares period of National Mourning for Mr Lee Kuan Yew". Channel NewsAsia. 25 March 2015. Retrieved 11 April 2015. ↑ "Stop suing journalists: RSF tells Singapore leaders". Bangkok Post. 2010-03-26. http://www.bangkokpost.com/news/asia/172827/. Retrieved 2010-03-26. ↑ "Bio of Lee Kuan Yew". Governmentof Singapore. Retrieved 10 September 2008. ↑ "List of Ig Nobel past winners". Archived from the original on 11 January 2006. .
↑ "Commemoration Day pride". Reporter. Imperial College London. 13 November 2002. ↑ Skehan, Craig (28 March 2007). "Hostile welcome for Lee Kuan Yew". Sydney Morning Herald. ↑ "Warm tributes from old friends". The White House. 29 October 2009. ↑ "Obama welcomes 'legendary' Lee Kuan Yew". AFP. 29 October 2009. ↑ "Remarks by President Obama and Minister Mentor Lee Kuan Yew of Singapore before Meeting". The White House. 29 October 2009. ↑ "Russia, S'pore move towards closer ties with new governmental body". Channel Newsasia. Retrieved 16 November 2009. ↑ Lee v. Globe and Mail (2001), 6 C.P.C. (5th) 354 (Ont.S.C.J.). ↑ "Lee Kuan Yew Denies Branding Islam as ‘Venomous Religion’" Jakarta globe, 5 September 2011. ↑ "Singapore's Lee backtracks on Muslim comments’" Channel News Asia, 28 January 2011. ↑ Goh Chok Tong. "International Conference on Muslims in multicultural societies". ↑ Lysloff, René T. A. Music and technoculture. Middleton, Connecticut: Wesleyan University Press (2003), pg. 113. ↑ 30.0 30.1 "Editor 'defamed' Singapore leader, BBC News Online, London, 24 September 2008. ↑ "Singapore backs Lee in media case" BBC News Online, 8 October 2009. 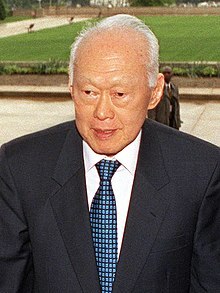 Wikimedia Commons has media related to Lee Kuan Yew. Culture Is Destiny; A Conversation with Lee Kuan Yew. Foreign Affairs, interview by Fareed Zakaria. War of Words Alejandro Reyes, Asiaweek.com, 25 September 1998. Retrieved 8 December 2004. CNN interview Part 1, Part 2: CNN's Fareed Zakaria talks with Lee Kuan Yew about his life as prime minister of Singapore. This page was last changed on 22 April 2019, at 17:04.